Waris Dirie was born as a daughter of Nomadic family in the region of Gallacaio, in the Somali desert on the border with Ethiopia. At the age of five, she suffered the inhumane procedure of female genital mutilation. This terrible crime against women is practiced worldwide by Muslims and Christians. According to WHO estimates, 8,000 girls become victims of this incredible brutality every day. At the age of 13, Waris fled from a forced marriage with a man who could have been her grandfather. After an adventurous escape, she arrived in London and worked as a housemaid and at McDonalds. At the age of 18, she was discovered as a model by the famous British Celebrity- Photographer, Terence Donovan, and photographed for the Pirelli Calender. She moved from London to New York and became one of the first African Supermodels receiving an exclusive agreement with the cosmetic group Revlon. She also graced the front pages of all the major magazines. She appeared as a James Bond Girl, alongside Timothy Dalton in “The Living Daylights”. The BBC commissioned the programme “A Nomad in New York”, based on Waris Dirie for their series “The day that changed my life”. The US based famous journalist, Barbara Walters, interviewed her on behalf of NBC. Waris was also interviewed by Laura Ziv for the magazine Marie Claire, in which she decided to tell about the cruel ritual of female genital mutilation and also her own destiny resulting in a wave of sympathy and protest worldwide against FGM. UN Secretary-General Kofi Annan appoints Waris as goodwill ambassador in the fight against female genital mutilation. She travels on behalf of the United Nations around the world, participates in conferences, meets presidents, Nobel Prize winners and movie stars and gives hundreds of interviews to draw attention to her mission. 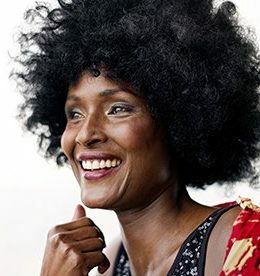 Waris Dirie has received many prestigious prizes and awards for her work and books, such as the “Women’s World Award” by President Mikhail Gorbachev (2004), the “Bischof Oscar Romero Preis” by the Catholic Church (2005), the “Woman of the Year Award” by the magazine “Glamour”(2000), the “Afrika Preis” by the German Federal Government and the “Corinne Award” by the holding organization of the German Book Trade for the best factual book. In 2007 the French President Nicolas Sarkozy presented her with the “Chévalier de la Légion d’Honneur”. The World Demographic Association nominated her as the first woman for the “Prix de la Gènèration” and the Martin Buber Foundation nominated her as the first woman for the “Martin Buber Gold Medal”. In 2002 she founded her own foundation, called „Waris Dirie Foundation” to support her work as a campaigner against FGM. In 2010, the Foundation was re-named “Desert Flower Foundation” to reflect the broader approach to addressing Female Genital Mutilation though economic projects in Africa. Currently, the organization has international headquarters in Vienna, Austria and has regional offices in Germany, Switzerland, the Netherlands, Monaco, France, Spain, the United Kingdom, Sweden, Djibouti , Sierra Leone and Poland. The official languages are English, German, Polish, Dutch, French and Spanish. The foundation’s team is made up of men and women committed to gender equality, human rights and all of them share Waris Dirie’s ideal: Ending Female Genital Mutilation. The Desert Flower Foundation and all its campaigns, projects and activities are financed by private donations.